Early identification of frailty at the front door of the acute hospital is vital to allow rapid comprehensive geriatric assessment and care pathway development in the most appropriate location. This article discusses the importance of developing robust processes to enable early identification and management of frailty in the acute hospital. It also highlights the benefits of developing a dynamic team of professionals at the front door of the acute hospital who are effectively trained to undertake comprehensive assessment. 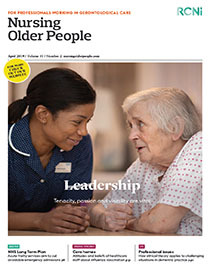 Effective care planning for older people with frailty requires meticulous coordination through collaboration across health and social care and this is demonstrated using an effective model which has been developed in a district general hospital in Scotland.